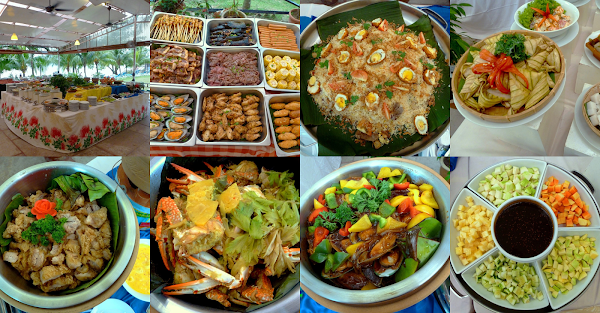 Special thanks to Rainbow Paradise Beach Resort for extending this food review invitation. Rainbow Paradise Beach Resort is a hotel along the main road of Tanjung Bungah. Located between Copthorne Orchid and Flamingo Hotel, Rainbow Paradise offers scenic views of the sea. Shady palm trees line the shores of the public beach just behind the hotel. Next to the hotel's swimming pool is Gaya's Beach Side Bar & Restaurant, one of the three eateries in the hotel; the other two are Breeze Cafe and Planters Lounge. Facing the sea, this al fresco restaurant takes advantage of refreshing marine breeze which seems to blow perpetually. On Friday and Saturday evenings, Gaya's hosts the Weekend BBQ Buffet Dinner in conjunction with the Ramadan fasting month. Bubur Lambuk (Malay porridge) is an essential dish for iftar meals. Flavored with meat and spices, the porridge is cooked until most rice grains have disintegrated into the soup. Soto Ayam (spicy chicken soup) and Mushroom Soup are other starters that can build appetite. Ulam-ulaman are raw vegetables like ulam raja (king's salad), jantung pisang (banana flower) and kacang botol (winged beans). As raw vegetables lack flavor, they are often eaten with powerful condiments like sambal belacan (fermented shrimp paste) and air asam (tamarind sauce). Ketupat are glutinous rice dumplings that are wrapped and boiled in palm leaf pouches. Also made from glutinous rice, lemang is cooked in hollowed bamboo stems over fire. 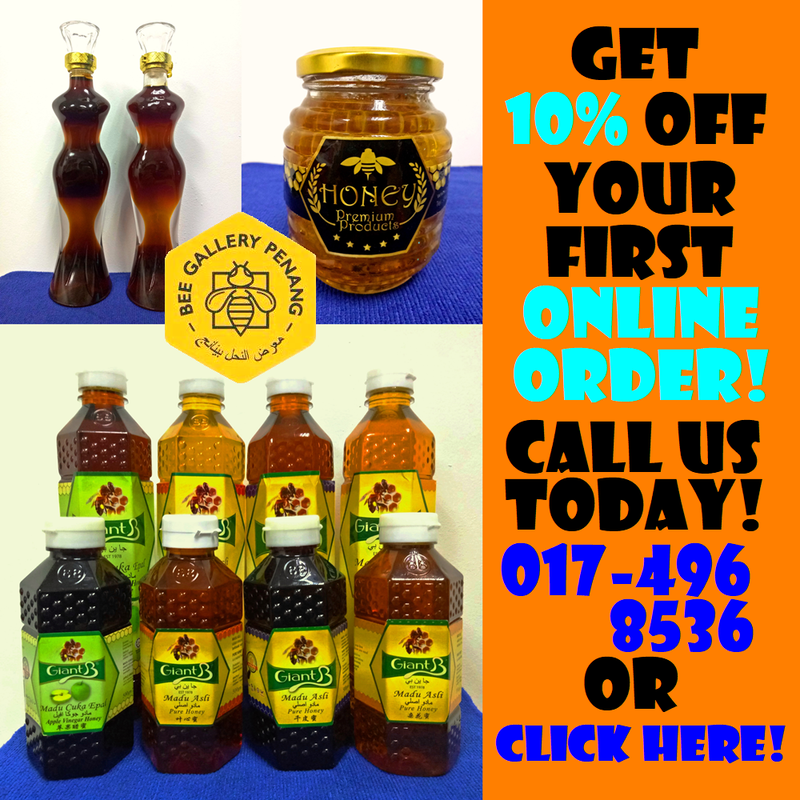 Nasi impit (pressed rice) is also available. These rice items are often eaten with serunding (meat floss). Also included are several types of kerabu (Malay salad) like kerabu ayam (chicken salad). Meanwhile, there are also Western-style salads like potato salad and coleslaw. At the gas-fired grilling station, diners can choose from beef slices, lamb chops, chicken wings, chicken satay, lamb kebab, ikan kembung (mackerel), mussels, chicken sausages and corn on the cob. Most of these raw foods have been marinated beforehand. BBQ, black pepper and mushroom sauces serve as condiments. Air asam is also popular among locals. And of course, peanut sauce is meant to go with satay. Chicken Shawarma is cooked on a rotating rotisserie with a heat source at the back. As the outer layer of chicken cooks, slices are shaved off and stuffed into pita bread. Other ingredients used for Chicken Shawarma are raita, tomato, cabbage and onion. Finally, pita bread is also dressed with ketchup and mayonnaise. Asam Laksa is a popular Penang dish. Thick rice noodle is served in spicy broth which is typically made from mackerel. Other ingredients are cucumber, pineapple, onion, red chili, lettuce and mint. 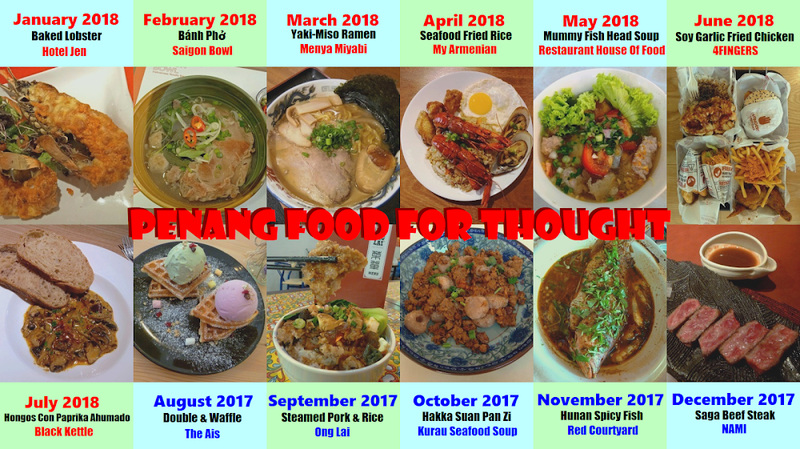 Very often, sweet-savory shrimp paste is also added to the broth to enhance its flavor. Sotong Kangkung is a special type of rojak (salad) with two main ingredients: cooked cuttlefish and blanched water spinach. The mixture is dressed in thick, sweet-tangy sauce with a hint of spiciness. Maqluba is a traditional rice dish from the Middle East. Rice is cooked in a large pot, which is flipped upside down when serving. In fact, "maqluba" (مقلوبة‎‎) literally means "upside down" in Arabic. Also served with Maqluba are slices of lamb, hard-boiled eggs, tomato, fried onions and parsley. The beef rendang packs a surprisingly strong punch of spiciness. Rendang is simmered slowly so that most liquid has boiled away and there is hardly any gravy left. One of my favorite dishes this evening is deep-fried chicken. The crispy breading goes pretty well with creamy mango sauce. If you are fond of shellfish, you will be pleased to know that the mussels are reasonably large in size. They are served with bell peppers and in savory oyster sauce. Speaking of shellfish, flower crabs are also available. The crabs are stir-fried with pineapple slices for the sweet-tangy appeal. Unfortunately, the crabs do not have much flesh under the shells. Next, black pomfret is cooked in dark sauce. Known locally as "bawal hitam", this fish is slightly darker than its cousin, the silver pomfret (bawal putih). The pot of mixed vegetables includes black fungus, button mushrooms, broccoli, cauliflower, baby corn and carrot. Rojak is a salad mixture of diced fruits like mango, pineapple, papaya, guava and cucumber. Rojak is typically served with thick shrimp paste with a hint of spiciness. Pulut Inti and Pulut Sekaya are sweet treats made from pulut (glutinous rice). Rice is eaten with kerisik (toasted coconut) or pandan custard respectively. To satisfy your sweet tooth, the buffet provides Malay kuih like kuih ketayap (rolled pandan crêpes) and onde-onde (spherical rice balls). Both types of kuih are filled with grated coconut and gula melaka (palm sugar). Meanwhile for Western pastry, there are layered sponge cake, chocolate walnut brownies and fruit tartlets. On the subject of fruits, presented on skewers are pitaya (dragon fruit), watermelon, papaya, pineapple and honeydew. Prepared in small cups is Sago Gula Melaka. This local dessert is made from sago pearls, gula melaka and coconut milk. Ais Kacang is a popular dessert especially after a warm day. Typical ingredients for this icy treat are attap chee (nipa palm fruit), cincau (grass jelly), buah pala (nutmeg), red beans and creamed corn. Gula melaka, sirap ros (rose syrup) and evaporated milk are used to flavor the shaved ice. After fasting during daytime, thirst is also a pressing matter. Fortunately, this evening's dinner includes free flows of coffee, teh tarik (pulled tea) and sirap bandung (rose-flavored milk). 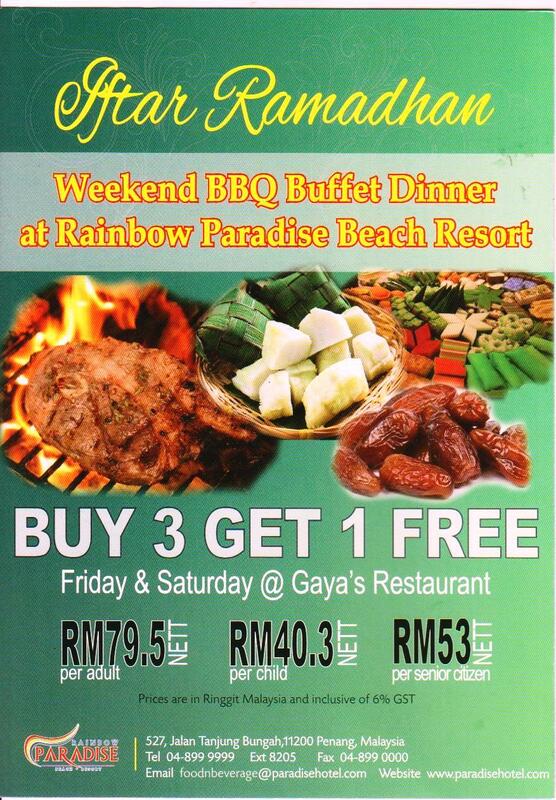 Rainbow Paradise's Weekend BBQ Buffet Dinner is priced at RM79.50 net for adults, RM40.30 net for children and RM53.00 net for senior citizens. For every 3 paying adults, the 4th person dines for free. Unlike most hotels, this buffet dinner is only available on Fridays and Saturdays between 26 May 2017 and 24 June 2017. It is also important to note that Gaya's is a halal-certified restaurant. Directions: Traveling westbound on Jalan Tanjung Bungah, drive past the pedestrian bridge near Dalat International School. Make a U-turn at the next traffic light-controlled junction and turn left to Rainbow Paradise. Gaya's is located towards the back of the hotel, just next to the beach. The hotel provides complimentary outdoor and indoor parking.